Since losing Jeffie to Leptospirosis (Lepto) and related liver failure, I now know more about Lepto than I ever cared to. I want to share what I've learned so that, hopefully, it may save the life of another dog. That's a quote from our veterinarian. Leptospirosis is caused by spirochaete bacteria belonging to the genus Leptospira. 21 species of Leptospira have been identified. It is also classified based on their serovar (distinct variations within a species of bacteria or viruses.). About 250 pathogenic serovars of Leptospira are recognized. That means it can be spread from animals to people. Infection in people can cause flu-like symptoms and can cause liver or kidney disease. In the United States, most cases of human leptospirosis result from recreational activities involving water. Infection resulting from contact with an infected pet is much less common, but it is possible. Rudy and Rosie are tired of me keeping a close eye on how much they're drinking, urinating, and the color of their gums because dogs are most commonly affected by Lepto. Leptospirosis in cats is rare and appears to be mild although very little is known about the disease in this species. Common risk factors for leptospirosis in dogs residing in the United States include exposure to or drinking from rivers, lakes or streams; roaming on rural properties (because of exposure to potentially infected wildlife, farm animals, or water sources); exposure to wild animal or farm animal species, even if in the backyard; and contact with rodents or other dogs. Jeffie became infected in his own backyard. Probably from partially eating a rabbit he caught. Some dogs with mild lepto infections never show any symptoms at all. Some dogs have a mild illness and recover spontaneously. Others develop severe illness and death. 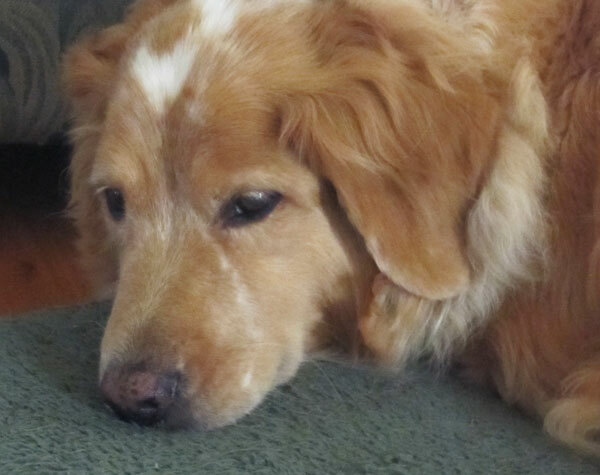 Jeffie had NO symptoms until overnight he became shockingly ill with weakness, shivering. He refused to eat anything, was reluctant to drink and seemed to be in great pain. When symptoms do occur they usually appear between 4 and 12 days after exposure to the bacteria. Clinical signs depend on the age and health of the dog, environmental factors affecting the bacteria, and the virulence of the particular species (serovar) of bacteria that is present. Signs of leptospirosis may include fever, shivering, muscle tenderness, reluctance to move, increased thirst, changes in the frequency or amount of urination, dehydration, vomiting, diarrhea, loss of appetite, lethargy, jaundice (yellowing of the skin and mucous membranes), or painful inflammation within the eyes. First Lepto attacked Jeffie's kidneys, then moved on to his liver and, eventually, his lungs. Jeffie became jaundiced, continued to refuse food, was dehydrated, weak and lethargic. Since the infection primarily affects the kidneys and liver, in serious cases there can be jaundice, which is a yellowing of the skin and mucous membranes. In dogs, it is usually most obvious in the whites of the eyes. Jaundice indicates the presence of hepatitis (liver inflammation) as a result of the destruction of liver cells by the bacteria. His last day Jeffie had some minor nosebleeds. We force fed him and kept him hydrated, but the Lepto continued to rage and caused acute respiratory distress. Leptospirosis can cause bleeding disorders, which can lead to blood-tinged vomit, urine, stool or saliva; nosebleeds. In rare cases, leptospirosis can also cause respiratory distress and acute pulmonary (lung) hemorrhage. Jeffie was hospitalized twice for a number of days so that he could receive IV antibiotics and hydration. He still refused to eat and had to be force fed. There is a vaccine for leptospirosis, but not all vets recommend it. The vaccine carries a risk of adverse reactions and can even trigger the disease in some dogs. It cannot protect against all serovars of Leptospira and, as we found out, the vaccine is not 100% effective. If you live where infections are a problem, it's important to keep your pet away from ponds, slow moving water and standing or stagnant water. Dogs exposed to potentially contaminated water sources or wild animals are at much greater risk than city dogs. It took a week of hospitalization with daily lab work, xrays, ultrasound and more to finally get a diagnosis. Titer blood testing from the state vet school labs confirmed our vet's diagnosis of Leptospirosis. Note: Titers may be negative in the first 10 days after initial infection, so many times additional samples must be drawn and tested to get a positive diagnosis. In Jeffie's case, we spent a whole week not knowing he was suffering from Lepto. Jeffie died in my arms as we were rushing to the vet. Probably from acute lung hemorrhage. Sources: The American Veterinary Medical Association and Dane Frasier of Terra Veterinary Services. Important information. I am still so sad for you. We choose to vaccinate knowing that it is not 100%. It is the best we can do to try to prevent it. I hope the rest of you stay healthy. I had no idea they could get it from eating rabbits or another animal. That freaks me out. Jasper catches rabbits and tried to find the squeaker. I knew about water, but this freaks me out. I will be sharing this Sue. It still breaks my heart that you lost Jeffie to this. So terribly sorry for you. We, too, chose the vaccine. We live in the Northeastern USA and the disease is supposedly not as prevalent here. But I guess some protection is better than none. I hate that you had to learn the hard way, but thanks for sharing your experience. Thanks for sharing this Sue, I know how hard it must have been for you to write it. I hope sharing your story may help someone else's dog. Such important information. Thank you so much for taking the time to share this. Our vet has discussed the vaccine with us at our appts. We are still in shock about what happened. I do catch wabbits, but I never eat them which is good. I admire you for writing this, Sue, it had to be so difficult. But it is so important for others to know about your awful experience. I wonder if they are doing more research to try to make vaccines more effective for this? I guess it's kind of like the flu shot - you just never know if you're getting the right one. Also, the fact that the blood test results take so long to come back doesn't help treatment much. Before we lost our beagle Kobi (to old age as it turned out), our vet thought he might have lepto. He wasn't worried....treatment can be effective in some cases I guess? But it took so long to get those test results! We don't vaccinate our dogs because it is not that common in our area. It's a tough decision either way. Again, I am so sorry you lost Jeffie to this awful disease, but thank you for sharing what you learned. Sue, there are no words, my heart is breaking and tears are again flowing. I can't imagine having to write this but I am so grateful! I had never really heard of Lepto until we moved (in the last 3 months) to Central Valley California. Thank you! Thank you for sharing this, I know it has to be such a hard time for you, and many of us are still in shock ourselves over what happened to Jeffie so quickly. It's scary to think many of us aren't knowledgeable at all about Lepto, so thank you so much for sharing all the facts. So sorry for your loss, but I admire your ability to pass this along & help others so they can avoid such heartache. I am so very sorry you had to experience that. It is such a sad time for you but you took the time to tell us all about this. Thank you. I had no idea about a lot of this stuff. Take care of yourself. I decided not to give my dachshund the vaccination because dachshunds are very sensitive towards it and can have very bad reactions. My vet said that as long as you catch it early with the symptoms they show then it is 100% treatable. Thank you Sue for being brave enough to write this all out. It was a horrible experience that you and Jeffie went through that I hope no one else has to go through. Lepto is out there and I just cringe when people come in to the clinic and decline the vaccine. I know it's not 100% effective but what if they did come in contact with the ones that you can get in the vaccine. So so sorry again for your loss and I hope you and your husband are doing ok. I hate that you and Jeffie had to go through this. But thank you for being strong enough to share this info and hopefully it helps others. Sending hugs. Hope you're doing okay. Thanks for sharing this so others can be aware. I am so sorry for what Jeffie had to endure. Writing this could not have been easy and you are a remarkably strong individual. It breaks my heart that you and Jeffie suffered through this, Sue. I can imagine how many tears you shed writing this post. Thank you for sharing your experience and the facts about Lepto here - you've helped to educate so many people and my have saved the life of another dog. Such important information Sue. I had never even heard of lepto until poor Jeffie. It was just so sad and I still tear up when I think of him. This must have been such a hard post for you, thank you for educating us about this horrible bacteria and what signs to watch out for. How long do you have to watch for symptoms with Rosie and Rudy, also you and Gary? Sending hugs to you all! Sorry for being so late with a reply. Thanks for sharing this important information. I wrote about it last year as there were several cases in our area. Now that I know more about it I don't let Dolly drink from the river when we go to the forest preserve. I've asked our vet about the shot for Dolly but because of her allergies he doesn't recommend it. Taffy has always had it so I continue to keep her vaccinated mostly because she'll eat anything. We are so sorry that you had to learn about this virus the hardest way possible. If you helped save one life I hope it helps with your healing.